Boyd Gaming gave us all an update on its progress with Echelon Place yesterday, announcing that thye’d broken ground and construction was about to begin in earnest. Tantalisingly, they also announced that new renderings of the $4 billion mega-resort would be made available, but hadn’t actually released them to the public – until today. Here, then, are those renderings. The first picture (above), shows an aerial rendering of the entire complex, and mighty impressive it looks, too. However, the second rendering (below, after the jump), is marginally less exciting. In fact, it’s quite dull looking! Hopefully this is just because it’s a poor rendering, as there’s little detail on display. 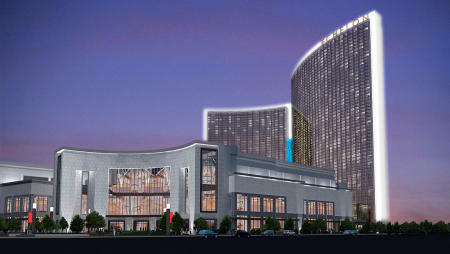 This second rendering shows Echelon Place’s main entrance onto the Strip, but apart from the two giant towers in the background, it looks a bit, well, anonymous. Time will tell, of course, what the finished project will look like, and any new renderings or pictures of Echelon Place will be published here as soon as they’re released. Keep checking back for more news as it happens, or add GloriousLasVegas’s newsfeed to your favourite news reader. Well the pictures are looking better, but I was back in Vegas in September and it sure is going up slow. Extra slow. 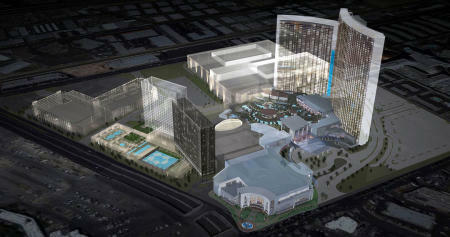 Now if they could just implode the Tropicana, Imperial Palace, and Sahara, that would make most of us happy. Keep building the Mega Casinos, I like those best.